The property has 3 double bedrooms, 2 bathrooms and a modern kitchen. The dining area is also fully equipped with a dining table for 6 persons and the lounge area has leather sofas and flat screen TV with english satelite, a selection of DVDs. The outside of the property has a private pool 8 x 4m with 6 sun loungers, bedside tables and large parasol also there is an outside dining table and BBQ area. The gardens are fully landscaped and overlook the green area. The property is very close to all the local amenities but remains peaceful, a car is not essential as everything is within a few minuets walk. The local transport is on the doorstep and very efficient and may be handy if you want to explore the local area. Self employed plumbing and heating engineer from York . Bathroom one has bath, basin, WC and shower. Bathroom 2 has shower, WC and basin. The living/dining room is equipped with large solid wood dining table with 6 luxury leather chairs. The lounge area has a large flat screen TV with DVD player and a large selection of DVDs, comfortable leather sofas provide a nice place to relax. There are 3 golf courses within an easy drive of the villa, Aphroditte Hills, Tsada and Secret valley. Excellent service from the owner and we fell in love with the villa. Spacious, well maintained, modern an well equipped. The pool was perfect as was the enormous roof terrace which was accessible from two main bedrooms. A great place to sit with a drink and socialise. The garden was lovely and the outside bbq and dining area was lovely. Coral bay has so many great bars and restaurants and whilst it’s just a couple of minutes stroll from the villa, it was peaceful during the day and night. Would definitely recommend coral bay and villa Lucas. Can’t wait to return! Fantastic villa in a great location. We have stayed at this lovely villa many times. It is in a quiet location but within easy walking distance to all amenities. The owner is very approachable and the property management people are first class . I would definitely recommend Villa Lucas to all my friends. Had a great time, the villa and outside space is lovely. We were told is was 500 metres to the main strip but sadly it is double this at least, my wife has walking difficulties so a little too far away for us. We had an issue with the agent (Andrew) who was rude and somewhat spoiled our experience. I have contacted the owner who has promised to look into and address this issue. Perfect accomodation, location and service! We stayed in this villa for two weeks from 24th July 2016 and cannot recommend it enough. After staying in villas across Europe we class ourselves as experienced 'villa occupants' and therefore have high expectations, which were met from the outset. The booking was smooth and well communicated from Andy, who was patient with all of our questions and queries. A few weeks before we left we were contacted by Sian and Andrew, the property managers, regarding arrangements for our arrival and transfers and yet again we were impressed by the clarity and speed in their correspondence and their helpfulness with our queries. Upon arrival our transfer was ready and waiting, after which we contacted Sian on the number provided and she was at the villa to welcome us despite it being late in the evening. Having someone to show us around the villa, answer any queries that we may have and provide a fountain of local knowledge and helpful tips was a new experience and one that allowed our holiday to get off to a smooth and stress free start. The villa is literally around the corner from the main strip of bars, shops and restaurants and yet it feels like it is secluded, mainly due to it not being overlooked and the size of the grounds. There are such a variety of places to eat that it is hard to choose, especially as the meals are all of such a high standard and therefore we found it difficult to imagine getting a bad meal....supporting one of Sian's helpful bits of information. The villa is spacious and although there were 5 of us, at no point did we feel like we were tripping over each other. The two teens with us certainly appreciated the Wi-Fi, whilst our 5 year old enjoyed the range of DVDS available. In fact in all aspects the villa is so well equipped and the pool, the size of which also reflects the space that this villa has, meant that we were often reluctant to leave, choosing instead to spend our days relaxing beside the pool, As expected nothing is ever 'perfect' so there were a few glitches, such as an air conditioning unit dripping or a step on the pool ladder cracking, however within a few hours of reporting it to Sian or Andrew, the problem was fixed without any disruption to our holiday. I can honestly say that this is the best villa holiday that we have had, due to the high standard of the villa but also the care and attention that we received allowed it to be a stress free and to get the most from the accommodation and the local area. location close to main restaurant's and bars, but not too close for them to disturb your stay. Villa well maintained with all the facilities you'd expect - fridge/freezer, washing m/c, TV/DVD, internet, bbq, etc. It's not overlooked so privacy when your in the lovely pool or sunbathing in the garden is good. We enjoyed relaxing at the end of the day on the terrace balcony, watching the beautiful sunset's. You can tell many people have enjoyed the property by reading the comment book in the villa. A most enjoyable stay and will return. The beach at Coral Bay is in easy walking distance (about 10 mins) and is generally considered the best in the Paphos area, you will find this has plenty for everyone with all kinds of water sport activities, sun loungers, parasols and a selection of places to eat and drink. 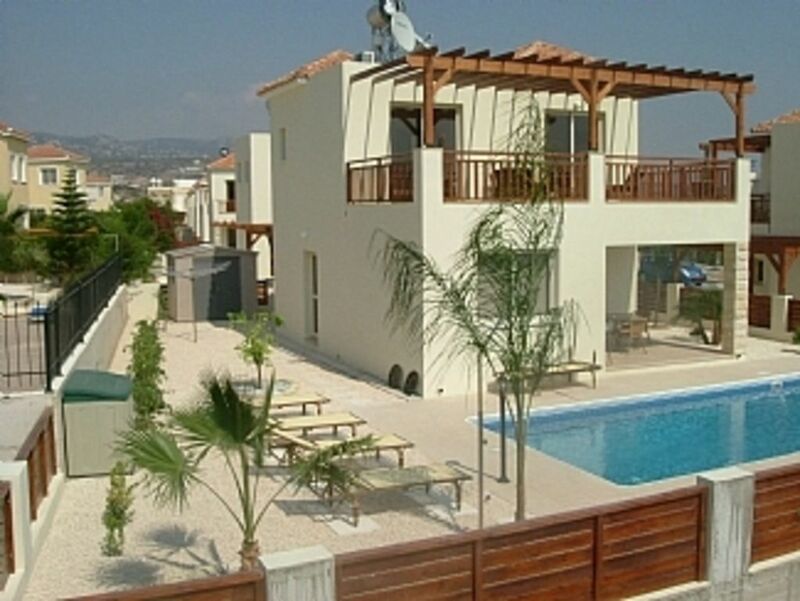 The nearest airport is Paphos airport which is about half an hour drive from the villa (transfers can be arranged on request), Paphos Town is only 10 mins drive from Coral Bay and the local transport is regular and efficient if you dont want to hire a car. I would highly recommend a trip to Latchi about a half hour drive, Its a beautiful village and you can hire self drive boats and visit the blue lagoon.